Patrik Laine thrills his home fans while leading Winnipeg to a 4-2 win over the Panthers. HELSINKI — Patrik Laine could hardly find a better place than home to show off his high-scoring instincts. Laine, from Finland, had a hat trick as the Winnipeg Jets beat the Florida Panthers 4-2 in the Finnish capital Thursday night. Laine scored in the second period and twice in the third, including an empty-netter, in the opener of a back-to-back series between the teams in front of a roaring sellout crowd of 13,500 at Hartwall Arena. Laine wristed a shot past James Reimer on a power play for a 2-1 lead with 4:46 left in the second, then slapped a one-timer for the winner on a two-man advantage from atop the left circle 3:28 into the third. He scored on an empty net for his fifth career hat trick. Mathieu Perreault scored the opening goal for the Jets (8-4-1), and Blake Wheeler and defenseman Dustin Byfuglien had three assists each. The Panthers (2-5-3) tied the score twice on goals by Keith Yandle and Evgenii Dadonov. • NHL Commissioner Gary Bettman said the NHL is planning to play a season-opening game in Prague and another two games in Stockholm next season. Bettman did not specify the dates or teams for the games, which will take place in November 2019, saying plans have yet to be finalized. CANADIENS 6, CAPITALS 4: Max Domi broke a tie with 21 seconds left and Jesperi Kotkaniemi scored his first two NHL goals in Montreal’s win at home. At 18 years and 118 days, Kotkaniemi became the second-youngest goal scorer in franchise history. 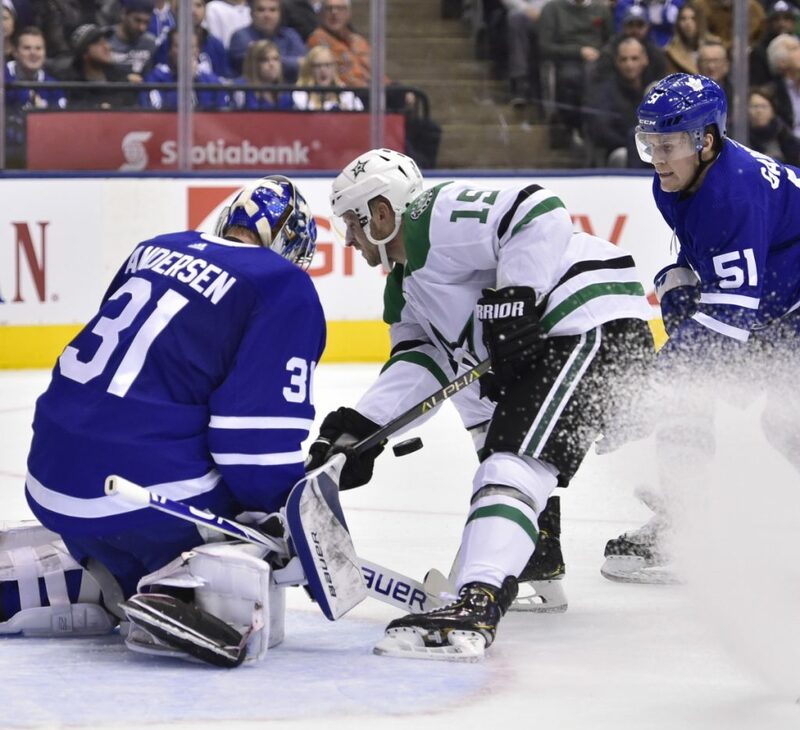 STARS 2, MAPLE LEAFS 1: Backup goalie Anton Khudobin made 30 saves to help Dallas win at Toronto. Jamie Benn and former UMaine player Devin Shore scored, and Tyler Seguin had two assists for the Stars. Patrick Marleau scored for Toronto, and Frederik Andersen made 16 saves. ISLANDERS 3, PENGUINS 2: Josh Bailey scored a short-handed goal in the second period and the only goal in a shootout to lift New York to a win at home. RED WINGS 4, DEVILS 3: Justin Abdelkader scored a short-handed goal midway through the third period and Trevor Daley put the puck into an empty net for another short-handed score in the final minute, helping Detroit hold off visiting New Jersey. The Devils pulled goaltender Cory Schneider with about 11/2 minutes left, and a Detroit penalty gave them a two-man advantage. Daley cleared the puck from below Detroit’s goal line and it caromed off the boards and into the net with 42.8 seconds left, giving the Red Wings a two-goal lead they needed. Marcus Johansson scored for New Jersey with 4 seconds left. PREDATORS 4, LIGHTNING 1: Pekka Rinne made 42 saves in his return after missing five games because of an injury, and Nashville won at Tampa Bay.